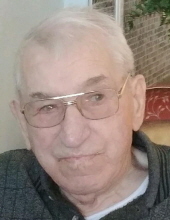 Robert E. “Bob” Suchomel age 93 of Monroe, WI, formerly of Shullsburg, WI passed away on Thursday, January 24, 2019 at Pleasant View Nursing Home, Monroe. Bob was born in Sun Prairie, WI on November 18, 1925, the son of Edward and Dorothy (Blaschka) Suchomel. He was united in marriage to Arlene Moyer on January 29, 1949 in Blue Mounds, WI. Bob overcame many hardships especially the loss of his mom at the age of twelve. He was a very diligent, hardworking man who lived to work. Bob farmed for several years until moving to Shullsburg in 1977. He drove milk truck for Roelli Cheese before working for Kendall Township, retiring at the age of 83. Bob is survived by his children: Steven (Karron) Suchomel of Ocean Springs, MS, Susan (Jay) Sobota of New Berlin, WI, Sally (Wendell) Phillips of Monroe, Sherry (Lonnie) Stauffer of South Wayne, WI, Scott (Sandy) Suchomel, Thomas (Debby) Suchomel both of Marshfield, WI, Diane (Clark) Scott of Shullsburg; daughter-in-law: Beth Suchomel of Lancaster, WI; 27 grandchildren, 23 great-grandchildren; a great-great- granddaughter and many nieces and nephews. Bob was preceded in death by his parents, his wife Arlene, son: Michael Suchomel; granddaughters: Jamie and Jennifer Sobota; great-grandson: Hudson Schollmeyer; siblings: Helen Chadwick, Ruth Suchomel, Ethel Weihert, Dorothy Duerst and Edward Suchomel, Jr. Per Bob’s wishes, graveside services will be held at a later date. To send flowers or a remembrance gift to the family of Robert E. Suchomel, please visit our Tribute Store. "Email Address" would like to share the life celebration of Robert E. Suchomel. Click on the "link" to go to share a favorite memory or leave a condolence message for the family.